Here are the details of the new update! When your ship explodes, the game only changes to the "Death screen" when you press a button or click anywhere. 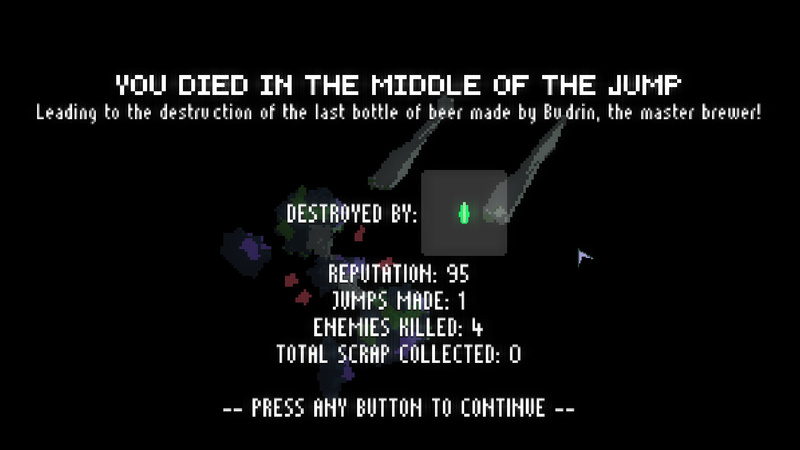 The enemies also don't die with your death explosion, so you can review what killed you. The "Eject explosion" still does damage to the enemies. The Death screen now shows what killed you. A small notification now pops up when you are on your "[LAST ACTION]" or when a "[NEW TURN]" starts. Base cost (in Scraps) for ejection decreased by half. It was 600 scrap, now it's 300. Now, if your ship is broken, there are more chances of finding an Event that offers repairs (only in "Unidentified" events). If the two extra ships have already been found, there are more chances of other rare events happening. Improved animation of Tutorial Slides. You can now click the Radar or Upgrades button to open or close these. If one of them is open, it automatically closes and the other opens next. Fixed the bug where the player could get stuck in the tutorial (in the part of upgrading the batteries). Fixed the bug where the Manual buttons are not deleted after it disappears. Other small bugs and Typos where fixed. Reformulation / enhancement of some parts of the game interface, such as the combat interface, to better inform the player of the current condition of the board and enemies. Think of a better "scanner" to get the idea. This update is due to late June or early August and will be FREE!!! Until then the next updates will only serve to correct new bugs found. Thanks for the support, Rookies!